The usability labs are located in the ICICS/CS building on the University of British Columbia’s Vancouver campus. The building can be located within the campus on Google Maps. 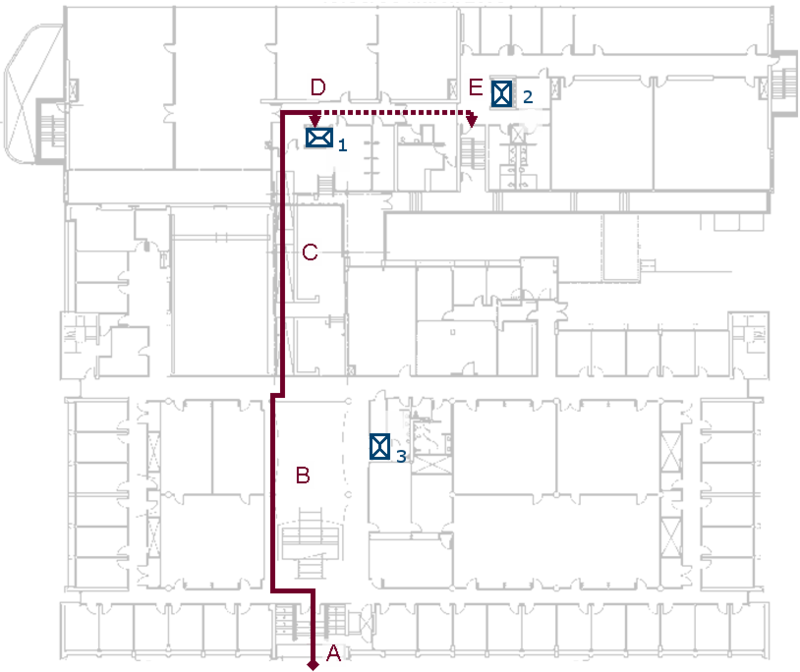 Directions to the building as well as parking information can be found on the Wayfinding page of the Department of Computer Science website. The usability labs are located on the 7th floor of the ICICS/CS building in rooms x715, x725, and x727. Below are directions to help you find the labs. Each step in the instructions is shown on the map at the bottom of the page. There are multiple elevators in the building, but only the North Elevator (#1) goes to the usability labs. The reception phone number in x727 is 604-827-4828. Enter through the main doors of ICICS/CS at 2366 Main Mall. Head up half a flight of stairs and through the doors. Towards the back of the atrium there is a ramp. Go up this ramp and through the doors. The North Elevator (#1) will be on your right. Take it to the 7th floor. Room x715 will be down the hall to your left, while rooms x725 and x727 will be down the hall to your right. To the right of the South Elevator is a set of stairs that go to the 7th floor. Room x727 will be to the right of the door from the stairwell, while rooms x725 and x715 will be further down the hall.